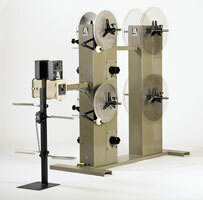 P/A offers both Standard and Custom Dual and Quad Payoff and Rewind stands. Our Engineering staff can design a system to provide more uptime for your Stamping or Plating operation. * Specify Input Power When Ordering, Metric Only. Consult P/A for higher speeds. Your delicate Pre-stamped, Plated or Polished product is Protected with Paper Interleaf. This allows for the safe rewind of delicate materials. A non-motorized paper interleaf with tensioning device may also be added. 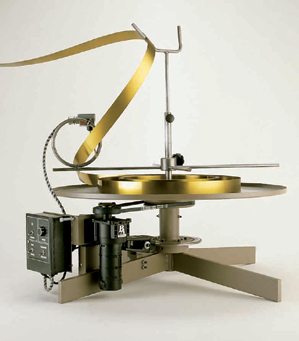 A motorized spindle with an adjustable slip clutch is used to rewind the paper interleaf. All motorized models are controlled by a touch probe loop control as standard equipment. Dancer arm, proportional Loop Control, ar any touchless sensor can be supplied as an option. Dual and Custom Models available. 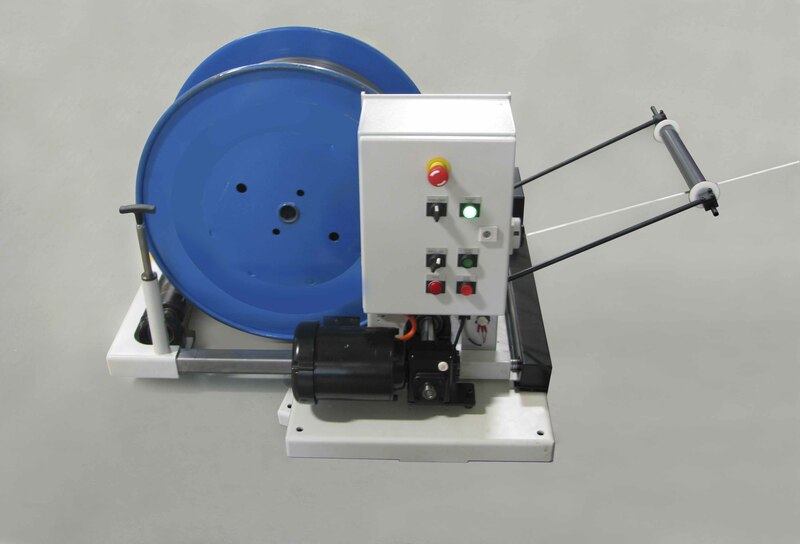 P/A's Light Duty Stock Reels are extremely versatile - a good idea for the job shop stamper running applications that require a free loop of material. The efficient DC Drive package ensures that the reel will automatically compensate, without operator intervention, for the amount of material per minute that your job requires. Two keeper discs prevent damage to the edges of the stock during rotation and eliminate side slippage tendencies of narrow coils. 42" & 48" Keeper discs are available as an option. Note: "A" designation is for Adjustable Mandrels to accomodate different coil ID's. * Consult P/A for higher speeds and heavy drive applications. * Non-Motorized reels are provided with caliper disc brakes. Save Production Time by loading the next coil while the other side is paying off to the press. A dramatic increase in Productivity is achieved by decreasing machine downtime. The Carousel Base reduces floor space by as much as 25%. Heavy duty bearings make 180 degree rotation quick and easy. Position accuracy is guaranteed by a spring loaded locking pin. Consult P/A for higher speeds and heavy duty drive applications. These high quality reels set the standard for performance and durability in the medium duty market. The reinforced steel coil keepers are individually adjustable with quick release, ratchet locking mechanisms. 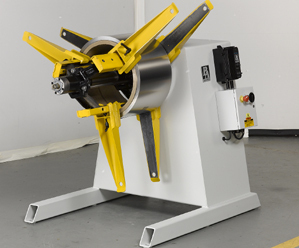 The spindle is heat-treated alloy steel, precision ground and mounted in oversized tapered roller bearings. Automatic centering of coil I.D. is manually adjusted with a hand crank that provides mandrel expansion. Motorized versions smoothly deliver material to automatic feeding equipment utilizing proportional speed control. 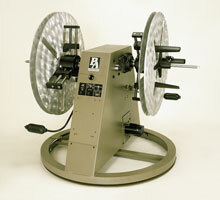 Non-Motorized reels have a standard friction brake which is adjustable to prevent material overrun when peripheral equipment is slowed or stopped. * 18"-21" (460mm-533mm) Expansion range available. Longer keepers available. ** Specify Input Power When Ordering, Metric Only. Consult P/A for High Speed applications. The oversized hand crank expands the mandrel which automatically centers the coil. Coil Keepers are easily adjustable and locked by quick release hand levers. Motorized versions have two proportional speed DC motors, one for each spindle. Each drive motor uses a gear reducer with torque limiter for additional gearbox protection. Consult P/A for additional range of expansion and higher speeds. The Mandrel assembly is made up of three cast, precision-machined jaws joined to the main shaft. The steel shaft is supported by oversized, tapered roller bearings mounted in a rugged housing. The housing is anchored to a heavy, welded steel base cabinet. Coils are automatically centered by hydraulic expansion of the precision-machined jaws. 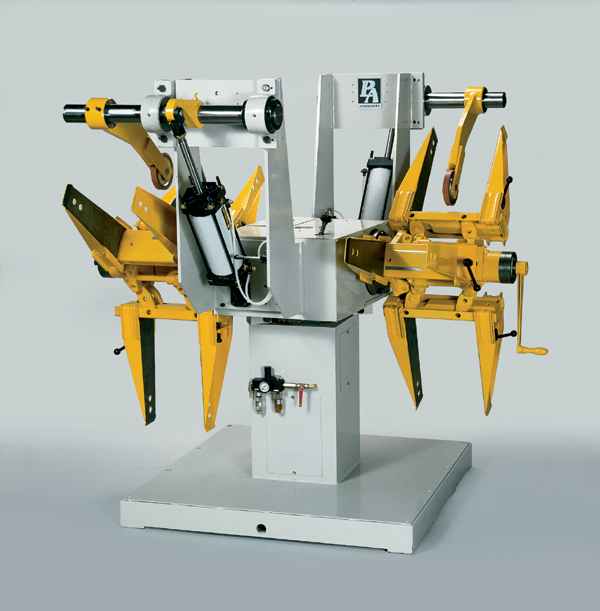 This combined with the optional hydraulic jog of the material makes Set-Up Quick and Safe for pressroom personnel. Hydraulic capabilities also give the operator the ability to rewind partial coils. Motorized Reels use a variable speed drive, while the Non-motorized models are equipped with an adjustable pneumatic disc brake. Pneumatic pressure arms, to prevent material clockspring during band cutting, are available as an option. * 22" to 25" (560mm to 650mm) available with additional wedges. Optional 72" (1825mm) OD available. The P/A Palletizer is designed to pay off pre-stacked coils of material one coil at a time. This simple, yet innovative, design effectively reduces the risk of injury to operators and damage to material by eliminating the handling of individual coils. Set-up is straightforward. 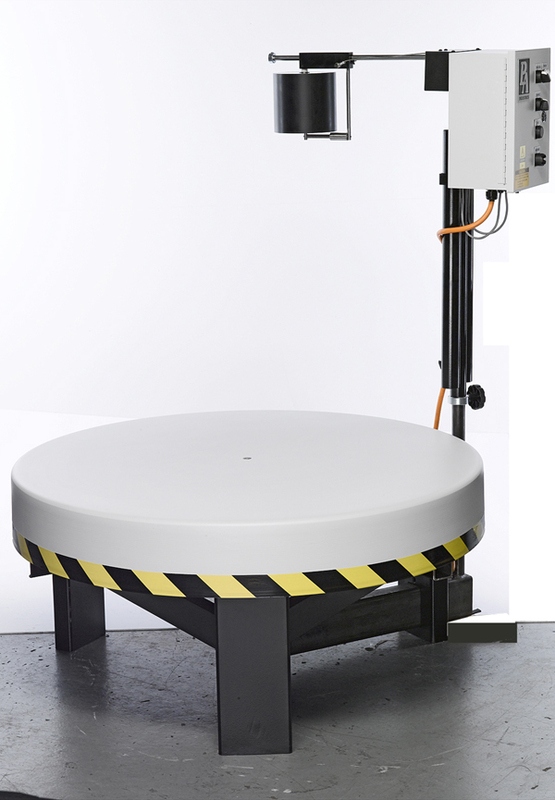 Simply load the pallet of coils onto the turntable with a forklift and set the guide for coil height. Then choose the direction of your rotation and feed the material into the press. No further adjustment is necessary. 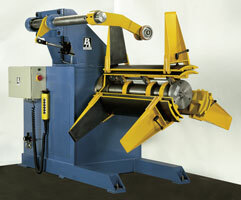 * Tension Guide rollers up to 22"(560mm) are available. *** Specify Input Power When Ordering, Metric Only. 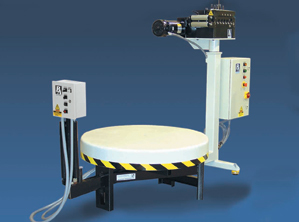 Incorporates all of the features of the Palletizer models with the efficiency of the P/A Straightening Head. Payoff pre-stacked material into the Straightener when space is at a premium. Tension Guide Rollers up to 22" (560mm) are available. Coil Weights up to 10,000 lbs. (4500 kg) are available. These reels have a dual bearing design that is housed in a cast iron hub to eliminate the "tip-over" threat - centering the coil on the platen is no longer necessary with this reinforced base. Material can be fed from either direction and taken from inside or outside the of the coil. The DC Drive package is equipped with dial in speed adjustment. A toggle switch chooses clockwise or counterclockwise rotation - just another value added convenience that is built into this inexpensive, yet versatile reel. Optional 1/4" (6.4mm) ribbed steel plate increases weight capacity to 1600 Lbs (725 Kg). 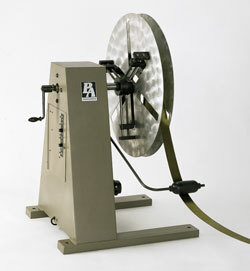 The low profile, EZ Lift design makes these reels very simple and safe to load. Swing open the locking end to roll your material into place. The Motorized Jacking Mechanism lifts the reel into position - No Crane Required. Rollers adjust to handle spool O.D. 's to 40" with the flip of a switch. Which Sensor best suits your application? Lightweight Dancer Arms work well with material that isn't highly polished, pre-painted or delicate. Loop Controls work with all of these challenging materials - and depending upon which your application requires, can require very little operator intervention. 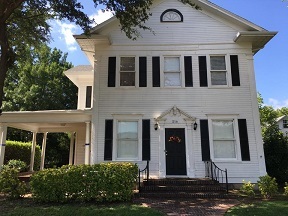 Consult factory for special applications.